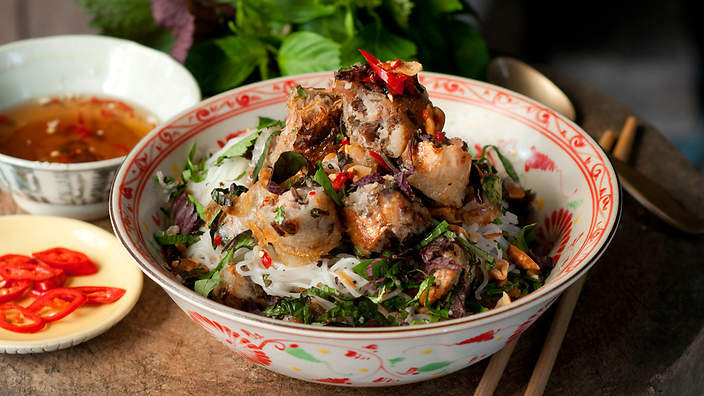 Vietnamese cooking is varied and usually superb, as the profusion of Vietnamese restaurants in New York, London and Berlin contest. It is a mixture of Vietnamese, Chinese and French traditions, with a plethora of regional variations. As in all countries of the region, rice or noodles usually provide the basis of a meal. Not surprisingly, fish is plentiful. Pride is taken in the fact that the freshest of vegetables are used and the vegetables and fruit served is seasonal. • Breakfast is often congee (rice porridge) or a meaty noodle soup locally known as pho. • Nem (spring rolls: pork mixed with noodles, eggs and mushrooms wrapped in rice paper, fried and served hot). • Banh chung (glutinous rice, pork and onions wrapped in large leaves and cooked for up to 48 hours, to be eaten cold at any time). • Nuoc mam (Vietnamese dishes are not complete without this fermented fish sauce). • Bun cha, (grilled pork, cold rice noodles, deep fried rolls and a big bowl of salad leaves). Tipping is now quite customary, especially in tourist areas, and is much appreciated in a country where salaries are still low. Upscale restaurants and hotels may add a 5-10% service charge to the bill. • Soda chanh is a refreshing lime soda served with freshly squeezed lime juice, sugar and ice mixed into club soda. • Vietnamese coffee grown in the Central Highlands is served thick, strong and black through a drip filter. Sometimes it is served with condensed milk to sweeten it. • Vietnamese green tea is light and refreshing and served at the end of meals. • Ruou can (rice wine) is made by members of the Vietnamese hill tribes and drunk straight from ceramic fermentation jars through bamboo straws. • Bia hoi or fresh beer is produced daily and served ice cold in small, local bars. It is not particularly alcoholic but very refreshing.